December 20, 2008 by Alphageek in "alphageek bourbon blanton´s single barrel"
I have been saying that I would update my web page for some time. I have been procrastinating for a while now. Hey, you reading this, when was the last time someone was honest enough to just admit they put something off? After all, you said you were going to read my web page a while ago, didn´t you? After all, the stats I collect on the web site indicate I have about five regular readers, and one of those is Mrs. Alphageek. I can tell when you regulars decide it is time to ¨catch up¨ with the Alphageek. I am going to post some short thoughts here. I was going through old pictures and found some short posts that I want to make. 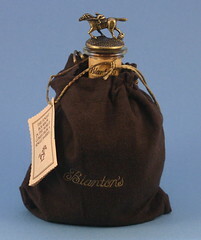 Today, we have a bottle of Blanton´s Single Barrel bourbon. I originally tried this bourbon thanks to my brother-in-law. He figured out that I like bourbon. He then did something innovative. He emailed a site and said ¨I know this guy that likes this bourbon. What other kind should I get him to try?¨ The result was this fine bourbon. I knew this was good stuff for three reasons. One, it comes in a bag. Two, it has a fancy stopper. Three, it is single barrel, which always seems to work for me. This is yet another great bourbon. (Note to the Alphageek, work on the description of great bourbon. You are getting repetitive.) This was one of the first ¨fancy¨ bourbons that I sampled, and it helped inspire me to try other bourbons out there. This particular bottle was enjoyed slowly. So slowly, that I had to enjoy the last third rapidly. I am ashamed to say that the cork had begun to dry out! This made drinking the bourbon critical because the bourbon was evaporating. After enjoying, I took these fine pictures to share with you. "alphageek bourbon blanton´s single barrel"